Voivod has walked many paths and experienced numerous lineup changes. At first the Canadians created some hard-driving thrash metal, with releases such as its 1984 debut War And Pain and the follow-up Rrroooaaarrr. More progressive fare followed, with Nothingface (with its outstanding cover of Pink Floyd’s Astronomy Domine) and Phobos (with its cover of King Crimson’s 21st Century Schizoid Man) serving as benchmarks of guitar-driven progressive metal. Principal vocalist Denis Belander left soon after the creation of 1993’s The Outer Limits (bassist Jean-Yves Theriault left in 1991), both of whom were replaced by bassist-vocalist Eric Forest. With 2003’s self-titled release, Denis Belander (‘Snake’) returns to assume vocal duties, and joining the band on bass is none other than Jason Newsted (‘Jasonic’), fresh from his stint with the once-mighty Metallica. Rounding out the lineup are its two veterans, drummer extraordinaire Michel Langevin (‘Away’) and guitar god Denis D’Amour (‘Piggy’). 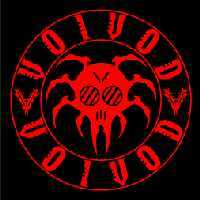 Guitar driven, woofer heavy, and progressive remain trademarks for Voivod. Belander’s voice reminds me a little of Blue Oyster Cult’s Buck Dharma: a little harsh, a little melodic, and very much captivating. Newsted’s low notes complement D’Amour’s six-string acrobatics, which are much more restrained than on previous efforts. The emphasis on this self-titled release is on composition, so the songs are tight and flow quite well. Lyrically, Snake continues to explore themes with a science fiction and political slant. For example, Blame Us discusses how society has enabled science to run wild, creating ecological disasters, gene manipulation, and monstrous machines. Rebel Robot explores similar ideas – the song notes that everything about us is synthetic, so much so that we have become flesh-covered automations. Science fiction takes center stage with The Multiuniverse, which is inspired by Michael Moorcock’s Eternal Champion novels. Sporting strange but cool artwork by Away, Voivod’s self-titled release has a little something for the disparate fans of the band, from blistering thrashers such as Gasmask Revival and Reactor to mid-paced crunchers such as Divine Sun (my favourite track, which features a catchy, psychedelic riff) and Les Cigares Volantis (Flying Cigars, which refers to the shape of some UFOs) to slower numbers such as I Don’t Wanna Wake Up. The CD is also a great place for new listeners to start their journey into the bizarre world of the Warriors Of Ice.